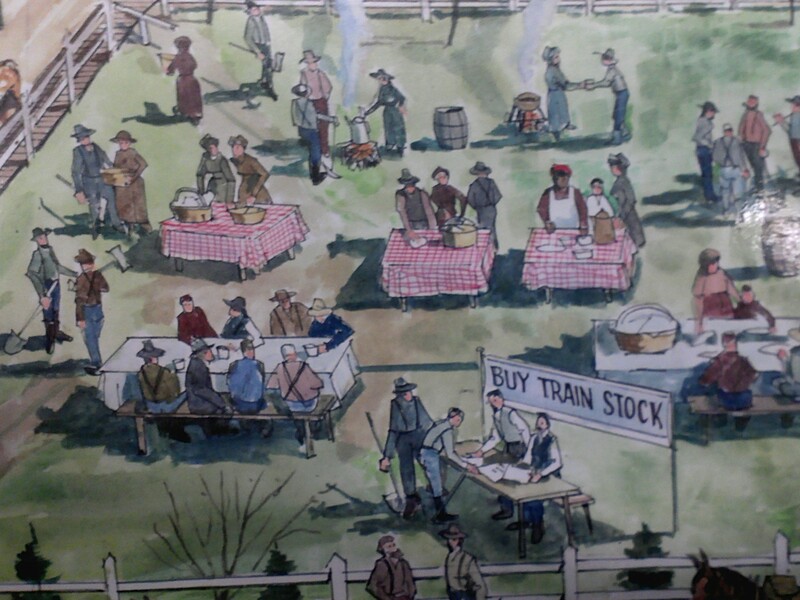 “Sylvester’s Window” is a series of historical paintings that track the history of Olympia in eight episodes from 1841 to 2001 that currently hangs in the Olympia Timberland Library. 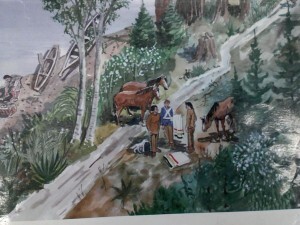 The project is a collaboration between Lynn Erickson and Robert Chamberlain. Each painting is from the same perspective, a third story window from Edmund Sylvester’s mansion on the south side of what is now Sylvester park, on the current site of Key Bank. This is the first in a series of features on the paintings, pointing out interesting aspects of each. These won’t be all inclusive descriptions of each painting, so if you’re interested in learning more, the Olympia TImberland Library has a study guide available in the reference section and for checkout.Below is a short description of some of the events captured in the first three paintings cover 1841 through 1874.“Cheetwoot,” Friday morning, July 9, 1841 Members of the Wilkes Expedition (more officially the United States Exploring Expedition) are seen canoeing up Budd Inlet. 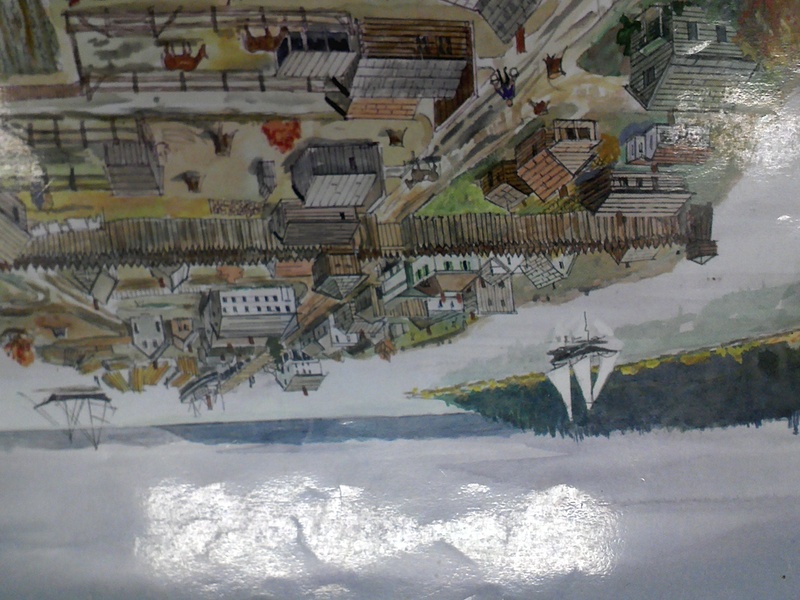 The expedition visited Puget Sound (including Budd Inlet) starting in late fall through summer 1841. Commanded by Charles Wilkes, most of the area’s geography (including Budd Inlet, Brown and Cooper points) are named by the Wilkes Expedition. Also pictured are members of the Hudson Bay Company, which began its presence at nearby Fort Nisqually almost a decade earlier in 1833. The British commercial operation lasted through the establishment of the Washington Territory, finally disbanding in 1859. Nisqually leaders Leschi and Quiemuth are seen with Thomas Otchin, one of the early settlers of Olympia. 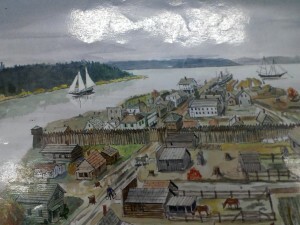 He was an Englishman that worked at Fort Vancouver and staked a claim in Olympia in 1841. He was by far the earliest non-Indian settler in Olympia. He didn’t last long, soon went south and settled south of the Columbia in Oregon. During the Indian War, the settlers in Olympia built a defensive blockhouse and stockade. 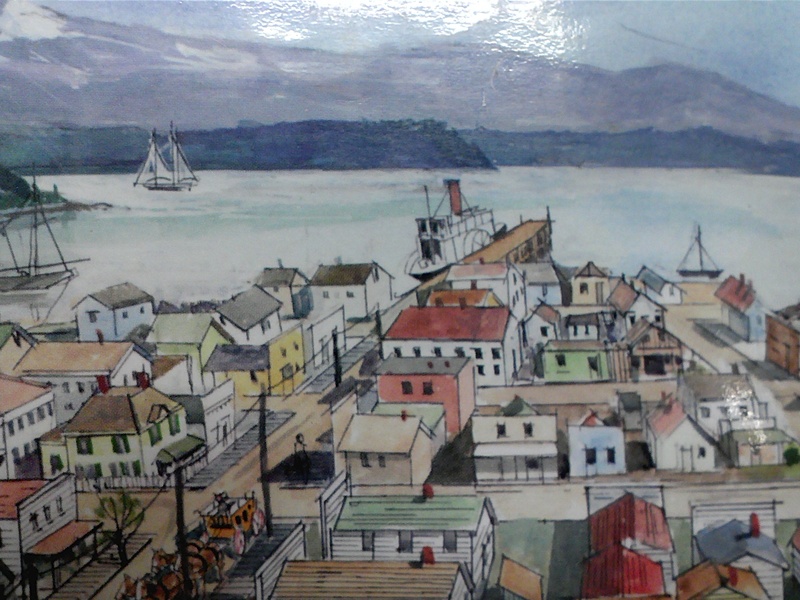 The stockade followed the current path of 4th Avenue and was built from “bay to bay,” which at the time would’ve stretch it between Plum and Water streets. Also during the Indian War, Governor Isaac Stevens raised several volunteer military units. The painting shows Gov. Stevens disbanding those units. Gidding’s Wharf, which attempted to bypass the tideflats to deep water in Budd Inlet, stretched 300 feet when it was built in 1854. Built by Edward Gidding, by the 1870s it had been extended and was known as Mile Wharf. 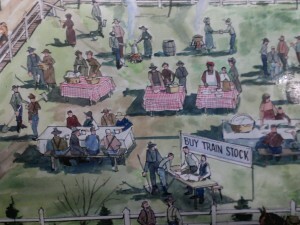 This painting prominently features the volunteer effort to connect Olympia by rail to the rest of the country. When Olympia wasn’t chosen to be the terminus for the Northern Pacific Railroad, which seemed to be more tied with the death of a railroad friendly real estate developer than geographic preference, Olympians mounted a volunteer effort to build a spur to Olympia. In the painting, 400 Olympians gather to work on the 15 mile route between Budd Inlet and Tenino. The railroad opened under the name Olympia-Tenino Railroad in 1878. It was quickly sold to a mining company and renamed in 1881, changing names once more before it ironically landed in the hands of the Northern Pacific, which had originally spurned Olympia decades before. At that point, work was already underway on a new line under Capital Way and through downtown Olympia and the original narrow gauge line from the 1870s was abandoned. Columbia Hall (near 4th and Washington where the State Theater now stands) was Olympia’s first city hall and was completed in 1869. The building was home to municipal government (council chambers, fire department) and some other government functions (such as a post office) throughout its life. The second floor housed a theater, ballroom and opera house until it burned in 1914. Barnes Bank (Capital Way between State and 4th) was founded by George A. Barnes in 1869. His first business interest in Olympia was a general store that he opened in 1852. Barnes Bank was the first brick building in Olympia and now is the oldest bank building in the state and Downtown’s second oldest building.